WEST MICHIGAN (April 6, 2014) — It comes around each and every year about the same time…Severe Weather Awareness week. It’s an effort by the National Weather Service to make us all more aware of the effects of severe weather and what could be coming during the upcoming prime season. You’ll recall the infamous 1956 F5 Hudsonville/Standale tornado outbreak April 2 and 3 and the Palm Sunday tornado outbreak that occurred on April 11 and 12 in 1965. This is certainly the season for that type of weather! Be prepared to hear the tornado warning sirens this Wednesday at 1:00 PM for a statewide drill. For those of us that have a NOAA Weather Radio the test will also be conducted via airwaves there. You can click here to get to the National Weather Service awareness page for more information. Also, get more information here for preparedness specifically for Michigan. 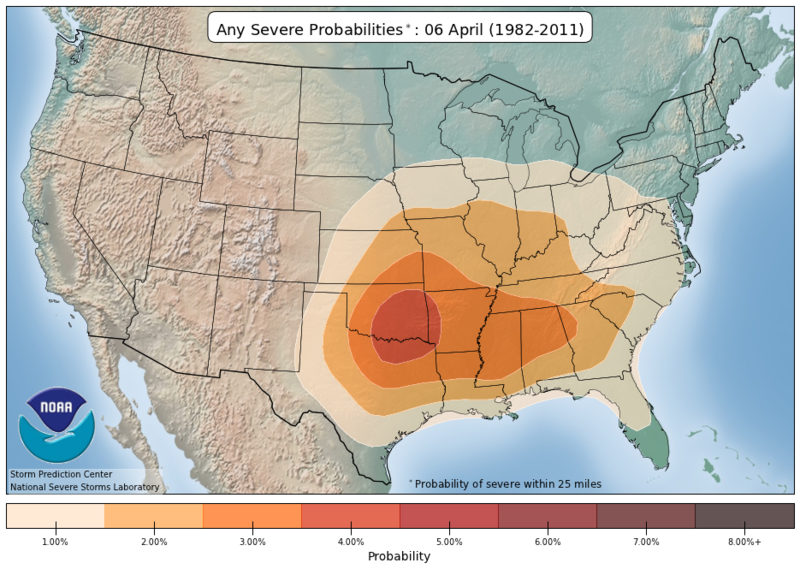 Here’s a link to the severe weather climatology for this time of year from the Storm Prediction Center. You’ll note the greatest threat for early April lies well south/west of Michigan where the air masses tend to clash from cooler Canadian air from the north and warmer moisture laden tropical air from the Gulf of Mexico. Remember, flooding and lightning kill more individuals each year than anything else. That said, tornadoes are killers too. Have a severe weather plan ready if the emergency arises. Simply put…know where to go! The basement is best in most houses and you should vacate mobile or manufactured homes for more substantial shelter. Never seek shelter from lightning under a tree! It could be deadly. Stay away from doors, windows, water, and electronics during severe weather. The attached photo was from the Palm Sunday tornado outbreak in 1965. This photo was taken by Paul Huffman of the “double tornado” destroying the Midway Trailer Park on U.S. Route 33 in Dunlap, Indiana. This next week of weather for West Michigan has increasing temperatures with a few 60 degree readings likely, but there are indications that we’ll see more below normal temps through mid-April. Get the complete forecast at www.fox17online.com/weather.